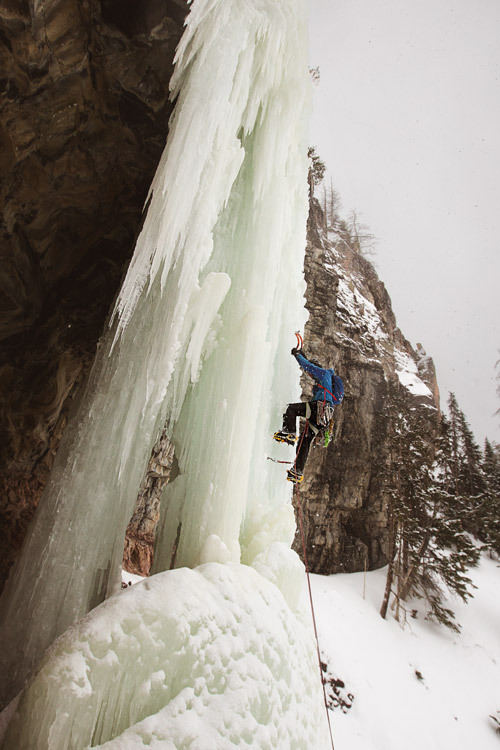 I’ve had a pretty fantastic ice climbing season so far this winter. Definitely my best yet, with over 22 days on the sharp and and sends of classics like The Squid, The Fang, and Joy After Pain. 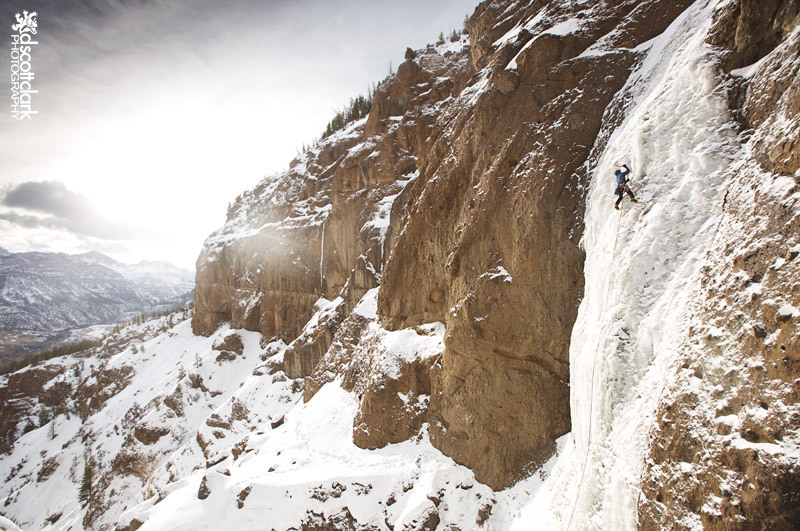 I’ve been mentally transitioning to ski mode over the last month or so, but still had some great climbing days. 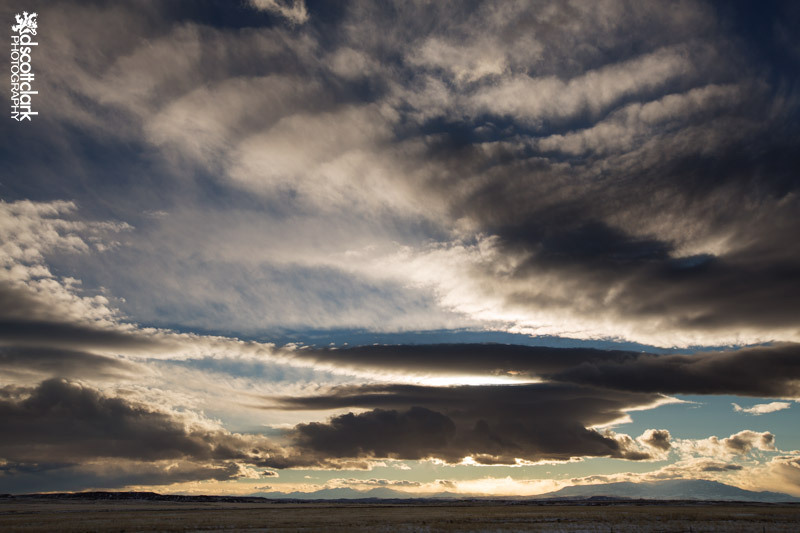 Two weeks after returning from Ouray, Alex Vidal, Vincent Keller and I decided to jump back in the car and drive the 8hrs to Cody, WY. I went the same weekend the year before and had an awesome time. I was excited to go back. After arriving at 1am to our hotel, we got up at 5am to make the most of our 3 days in Wyoming. It takes about an hour to get from town to the parking area for many of the South Fork climbs. 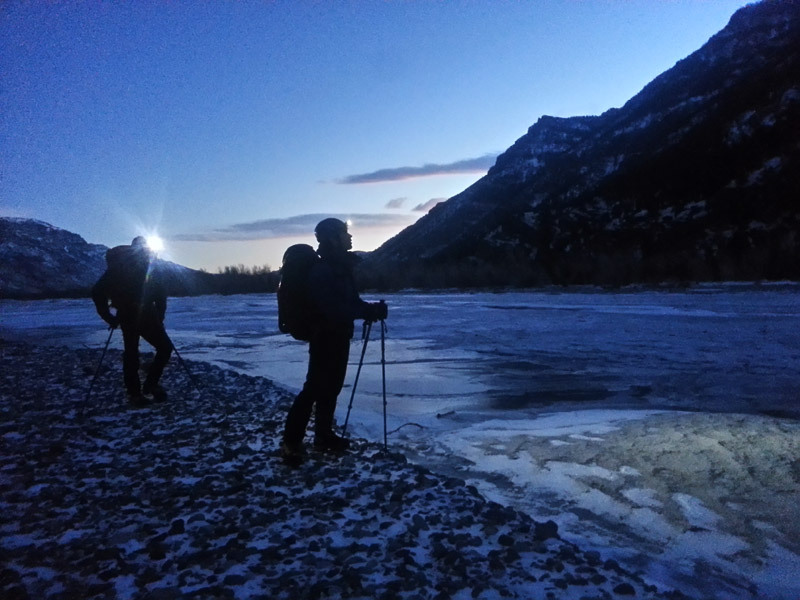 We crossed the Shoshone River just as dawn was breaking. There was a lot less water in the river than last year, but the temperatures were warmer and the ice seemed a little suspect. We discussed if we should go back, but I really wasn’t feeling very wet and said we should continue. We found the trail on the south side of the river and started following it. It became clear we were not the only ones to take the trail that morning…a mountain lion’s tracks, with paws as big as Vincent’s hand, were following a deer’s tracks. The prints were quite fresh and the brush around the trail was perfect for a cat to wonder through undetected. We were on full alert for the 1/2 mile the tracks continued along the trail. We finally reached our objective, Mean Green (WI5). The first pitch is 65 meters of fun 4 climbing to a shelf. 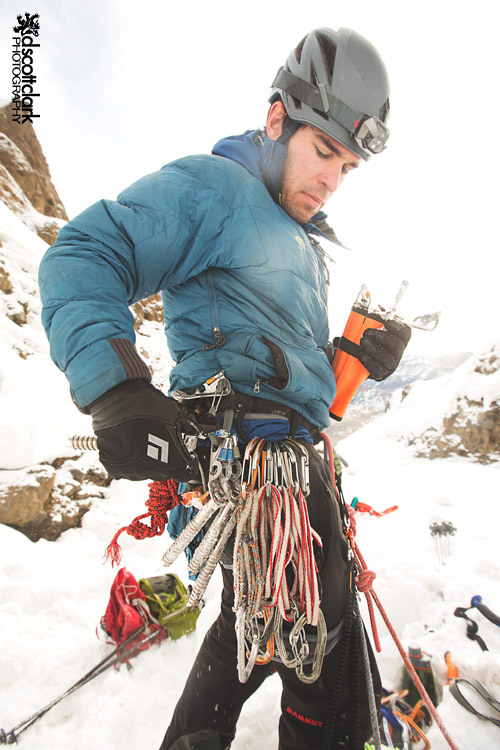 When I reached the base of the 2nd pitch I felt like I could easily combine it with the first pitch on 70m ropes. Vincent and Alex were already tied in and started to simul-climb when the rope ran out (I was leading while they climbed below me. If had fallen, I would be caught by their weight and vice versa). The top of the 2nd WI4+ pitch was quite thin and snow had corniced badly over the exit. It took me at least 10 minutes to clear a hole in the cornice to reach the top of the falls, and no where was there good protection. Once I topped out I saw that the anchors were still another 40 feet away. 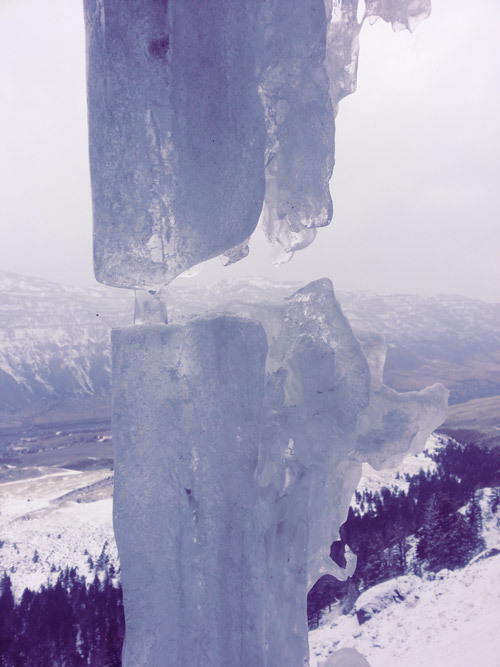 I could only move as fast as Vincent and Alex were climbing, so I crawled, shoving my ice tools as deep into the snow, hoping they might catch something if one of my followers happened to fall. 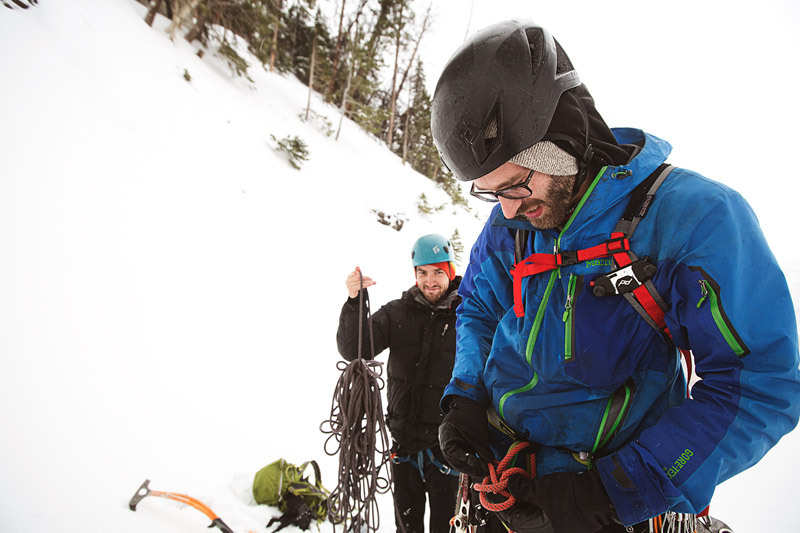 I was quite thankful when I attached myself to the anchor and put Vincent and Alex on belay. The third pitch was a 30 meter 4+ that was quite thin at the top, which Vincent led. I followed up the column and posted up on the lip to take some photos of Alex Climbing. We wallowed for a while to get to the 40 meter pitch 4, the crux WI5 pitch. The bottom half was steep then if slabbed out at the top. From the anchor I could just make out the top of pitches 6&7, combined total of 85m of WI3-3+ climbing. From what I could see it was another 200+m wallow through waist deep snow to get to a snow covered slab – not the most enticing prospect. It was probably an hour and half till dark and I didn’t want to have to find our way out after that, so we elected to descend after pitch 4. The rappel from pitch 3’s anchors were off some tat rapped around a tiny tree and equalized with more tat stuck in the frozen mud. Pretty confidence inspiring. Alex decided to put in the “bomber” screw (above) in a couple inches of ice. The sun had been out all day blasting the ice on the river. We got back to the point where I had fallen in and the ice was even less thick. Up river a few hundred feet we found a very nice ice bridge to cross. Waking up at “Oh dark thirty” again we get to the parking lot for Joy After Pain well before sunrise. I had been to Joy After Pain exactly a year before, climbing with Asa Firestone and Michael Goodhue. Asa & Michael led the harder pitches, but we didn’t get to “The Joy”, the last WI5+ pitch. I was excited to lead the hard pitches and climb the Joy! Approaching the first pitch, it looked considerably thinner than it did last year. The base was barely touching down. 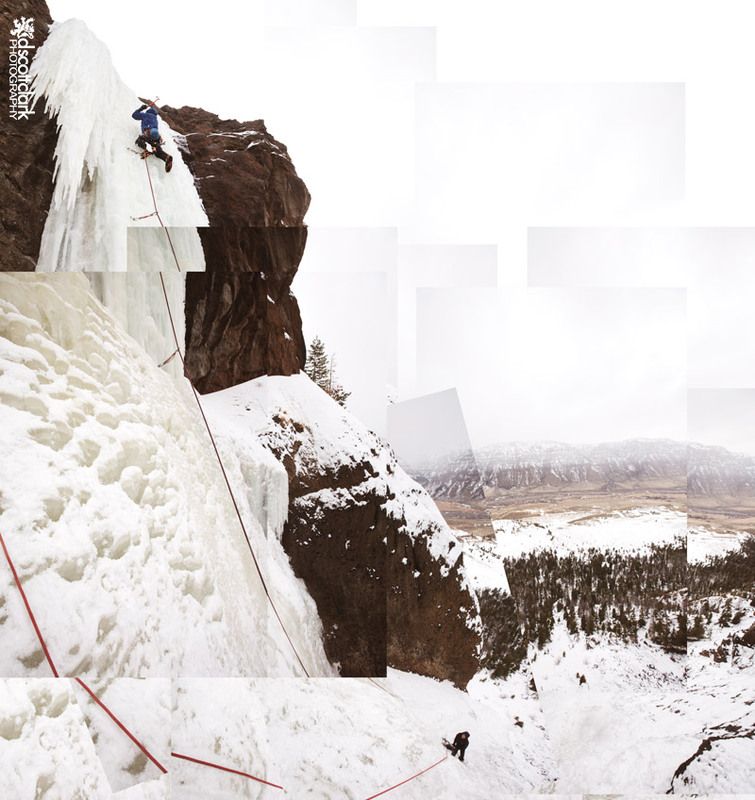 And on closer inspection, the ice on climbers right was extremely suspect. There was a lone pillar that barely touched down in the middle. The ice above the pillar was clearly the best option for the climb, but that meant ascending a pillar six inches in diameter at the base! As soon as I stepped up to climb the separated base section fell over. I lightly hooked my tools, did a pull up, gently set my right crampon point on a small feature, and wrapped my left leg around the pillar, realizing why people climb with heal spurs. I repeated for another 2 moves then was on slightly more solid ice. I didn’t want to place my first screw until I was at the point the ice met the rock. Left: the tenuous start to Joy After Pain Right: An overview of the first and second pitches. The bottom half of the almost 200m first pitch was slightly overhanging, getting my arms quite pumped. The top half angles back, putting most of the weight off your arms and onto your legs, which causes your calves to get pumped. I was happy to a V-thread anchor at the base of the 2nd pitch. Cautionary tale: Check your knots! Alex started following me up the Pain, and after only a little bit began yelling strange requests. “Slack!! Give me Slack! Hold up! Alright, On you!” I couldn’t see what was happening. Just after Alex had gotten above the pillar, he looked down to see that he had not finished his figure 8 knot. He had placed a screw and gone direct to that to retie his knot. Definitely a wake-up for all of us. Vincent took on pitch 2, his first time leading WI5. 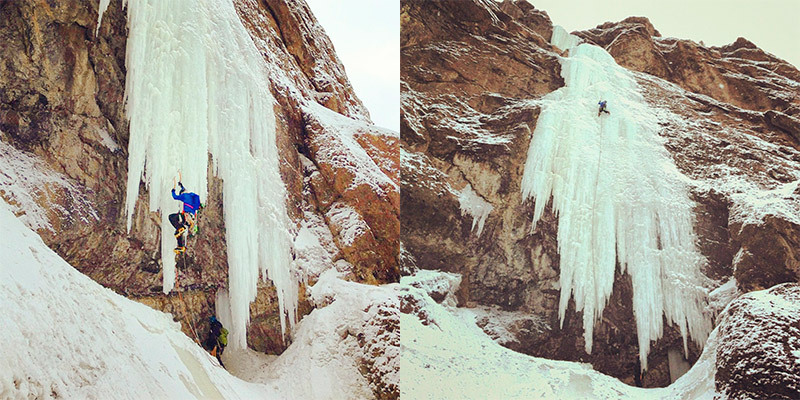 Having just started ice climbing in November, its amazing seeing him progress so fast. 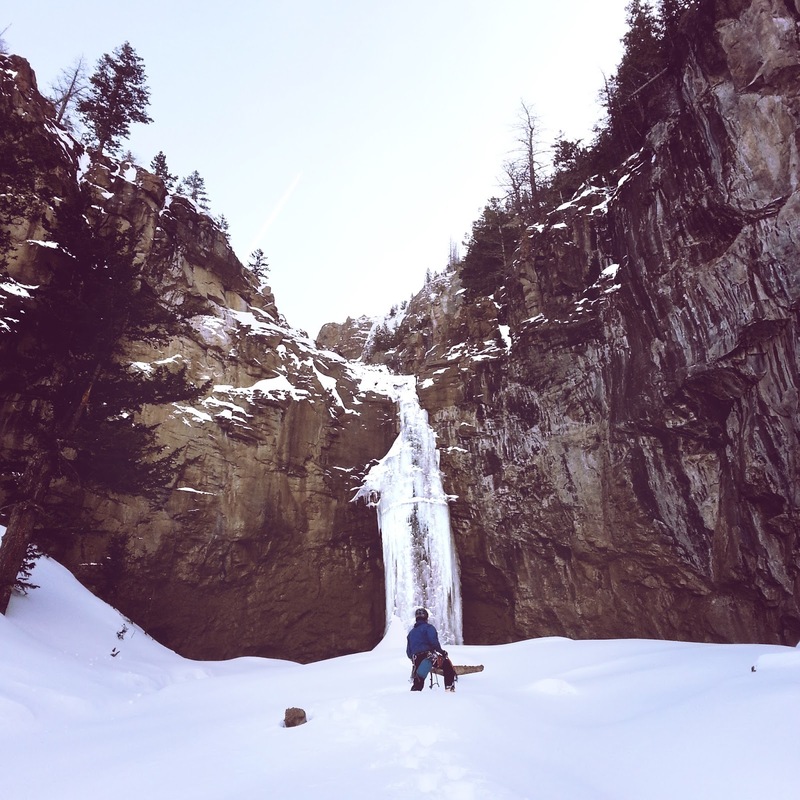 More snow wallowing – kind of the story of our trip. 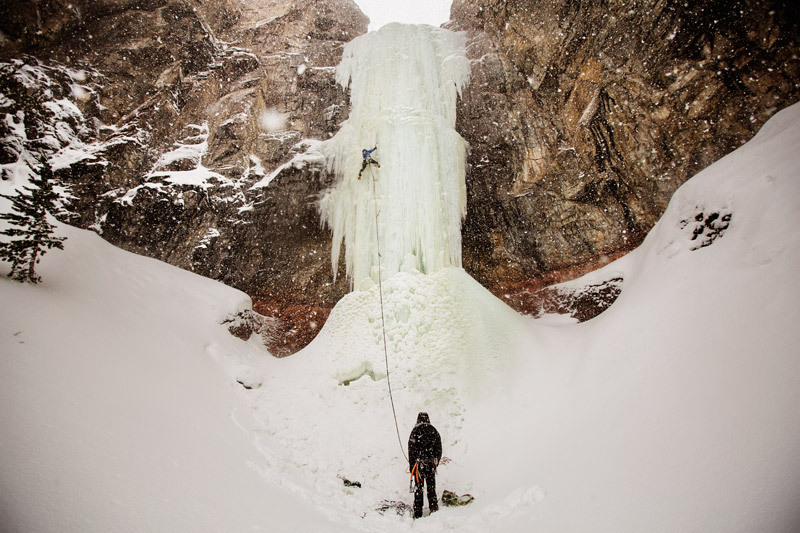 Makes you appreciate the vertical ice pitches in Ouray. 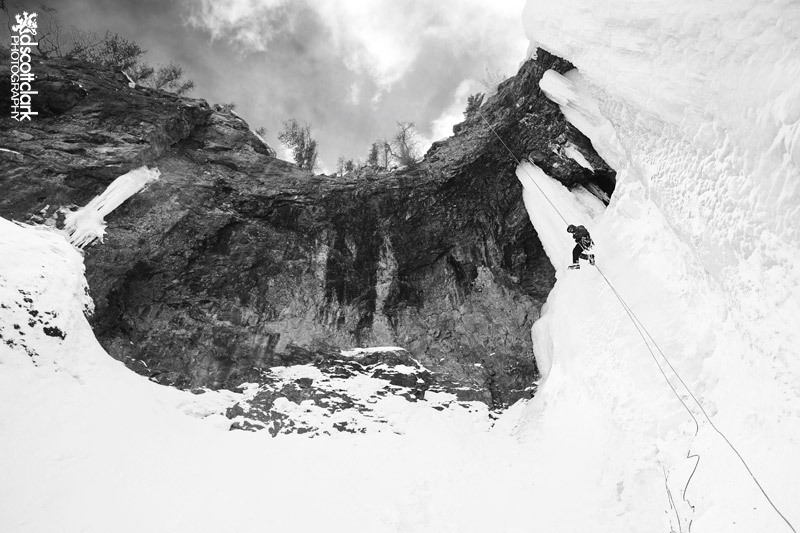 Pitch 3 is a WI3/snow climb up a small gully that leads to pitch four, 40m WI3+/5 (depending on where you climbed). We wallowed some more to get to the final pitch of Joy After Pain, otherwise known as The Joy. There was a short 30ft steep WI5 section leads to a large shelf before the meat of the climb. Vincent and I decide to solo it to speed things up since it was getting late in the day. So not only did Vincent lead his first WI5, he also soloed his first WI5. I was psyched to have sent this climb that felt very hard last year (and we didn’t even finish it). The Joy After Pain – and incredibly classic climb. (We also didn’t get lost on the hike out, like we did last year). Our last day in Cody we decided to climb The Schoolhouse Route, a popular route on the north side of the South Fork. 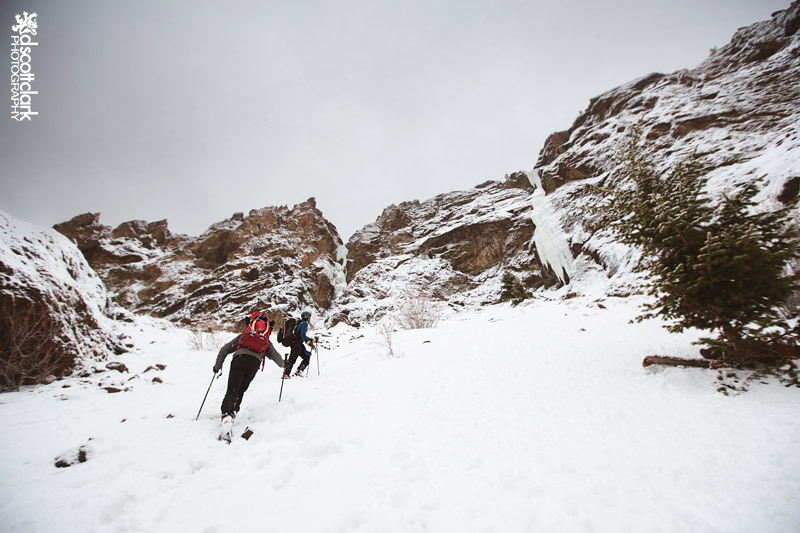 The approach is one of my favorites, climbing small ice rollers and falls through a very narrow gorge following a creek bed for about an hour. 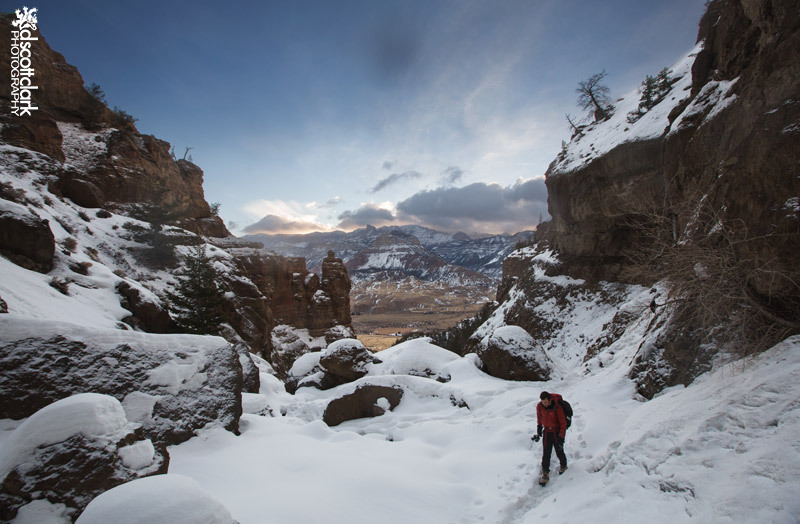 Alex on the approach to the Schoolhouse Route as the sun rises over the southern peaks. It was nice to climb in the sun for once. 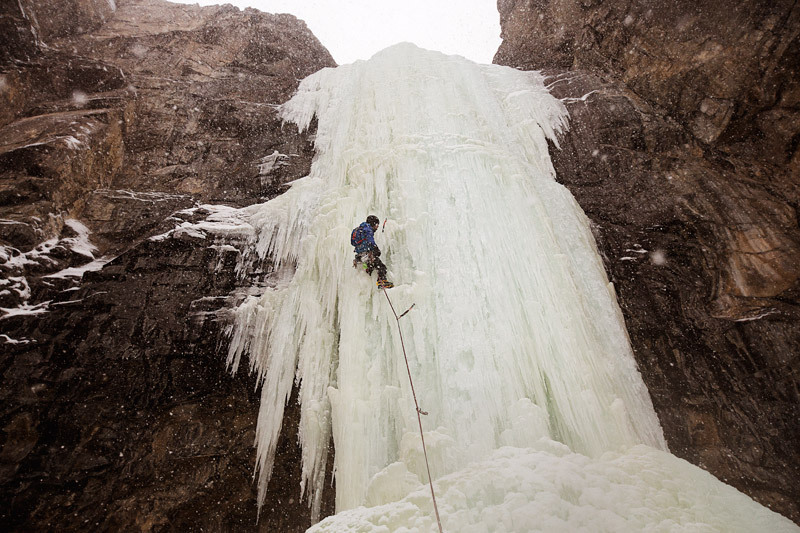 Much of ice climbing is trying to avoid the sun for the healthiest ice. This climb gets a bit of sun in the morning but mostly stays shaded. Vincent led the first pitch and Alex and I simul-climbed to save time. We got to the anchor and debated going to the 2nd pitch. None of us were feeling particularly motivated. But we decided to wallow for a bit and see what it looked like. 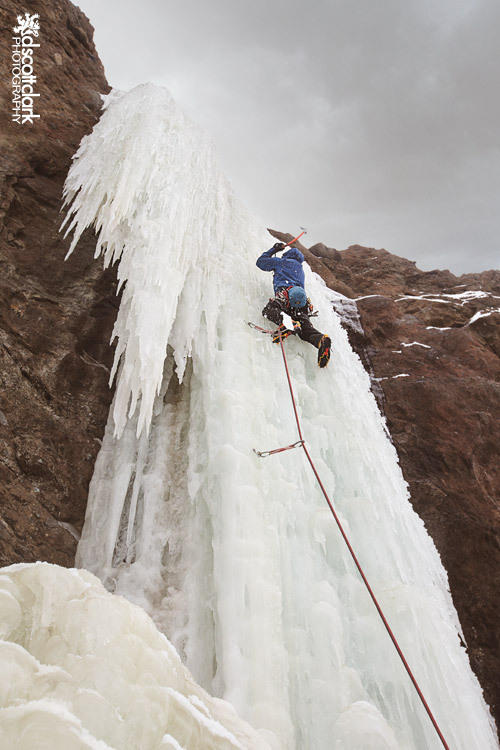 The 2nd pitch is usually in WI4 condition, but this year it was quite steep and wet, definitely at least WI5-. All of us were ready to be on our way back to Boulder, exhausted after 3 long days of climbing. We hurried down the drainage and got back to the car in roughly 20 minutes from the base of the 1st pitch. 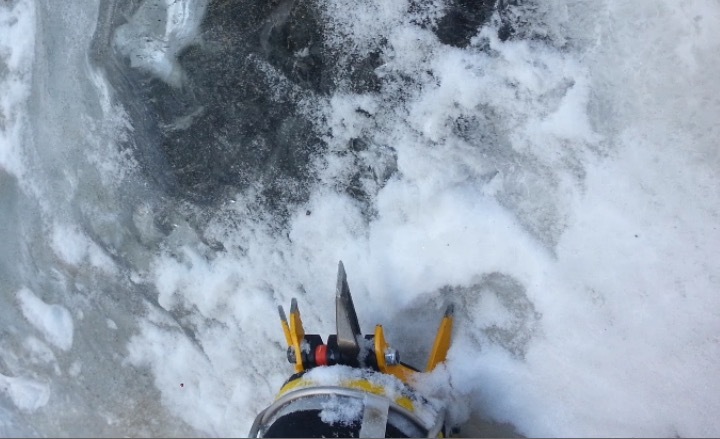 We kept our crampons on because we had to down climb some of the small rollers of ice. But I found out why you shouldn’t hurry with crampons on. 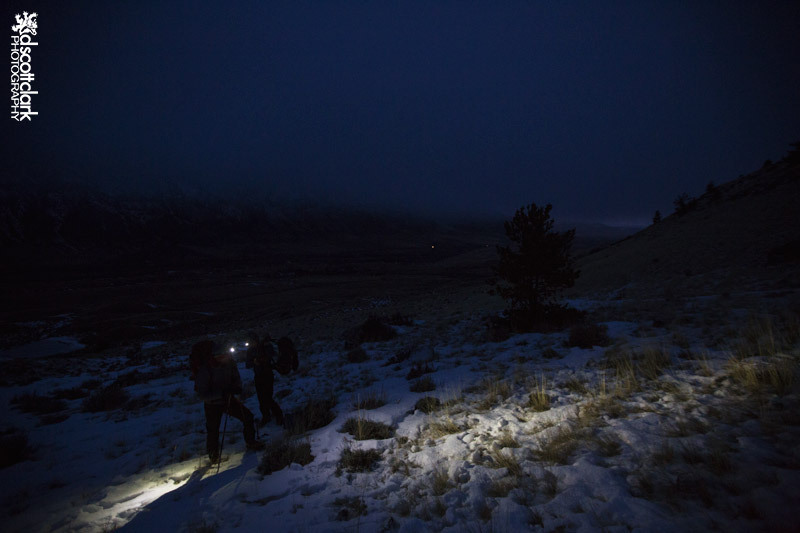 While moving quickly to keep up with Alex and Vincent and stepped off the path and my left leg postholed up to my knee in snow. My right cramponed foot kept swinging at full speed and connected with the back of my calf. At first I thought I’d just given myself a good charlie horse and kept running downhill. It hurt, but I was still able to walk. When I got to the car, I took off my boots and jumped in the car. 10 minutes later I stopped to take some photos of the landscape. When I jumped out of the car, my left leg almost collapsed. I couldn’t put any weight on it. I pulled up my pants to find a hole in my calf spitting out blood. I had stabbed myself quite handily with the front point of my crampon. According to the size of the hole in my pants and leg, the majority of the front point entered my leg. For reference, this is what that looks like. It kept bleeding for around 4 hours and I debated asking Vincent to stop at a clinic on our drive home, but really, in most of backcountry Wyoming, there’s not much in the way of emergency clinics. I got back to Boulder, got a tetnus shot, and it healed quite well. Fun times. Start the trip by falling into a frozen river and end it by stabbing myself with a crampon. At least I know I’m a clutz. 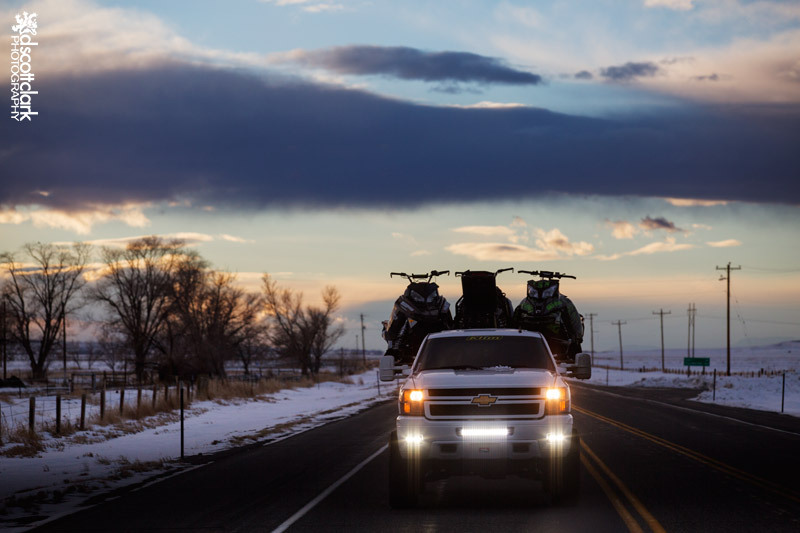 This truck was very overloaded, with the sleds sticking out quite far on both sides of the bed. The driver turned on the brights when he saw me sticking my head out of the sunroof to take this photo. 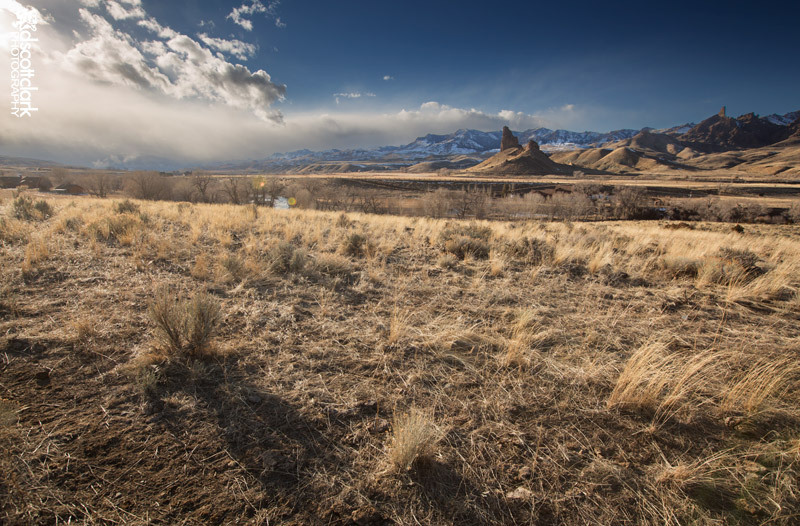 The climbing in Cody is incredible, and there is so much more to explore. Definitely excited to return next year. 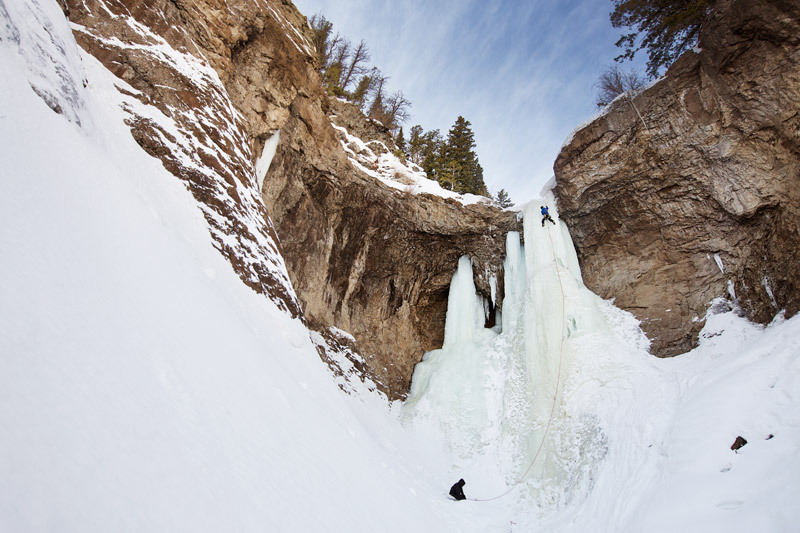 There are plenty of routes to climb without repeating any again, but that’s one thing I love about ice climbing, each time you climb the same route it is a different climb. A great trip with great friends. 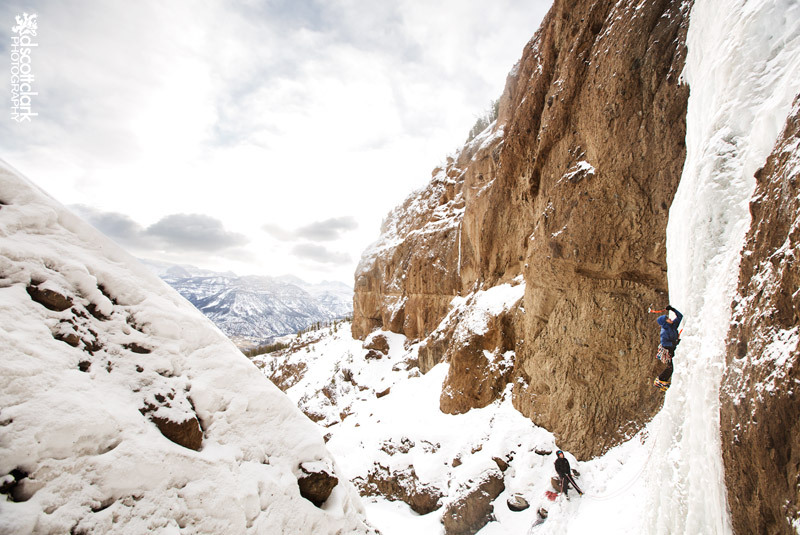 Previous Previous post: Ouray Ice Climbing New Years!